Lion is releasing a limited-edition version of its Guinness beer in celebration of St Patrick’s Day. St Patrick Day falls on 17 March annually. The “The 1798 Limited Edition” comes in a 750ml corked and caged bottle and is designed for sharing. It is a double extra stout with chocolate, vanilla and liquorice flavours. Lion said it used the original oak wood from storage vats in the Old Vat house where Guinness had its start in Ireland in 1759. “Guinness The 1798 is an intensely rich, smooth double stout with a uniquely subtle smoky character,” said Michael Donnelly, one of the brewers who helped create the beer’s recipe. Lion acquired the Guinness brand from British beverage company Diageo in 2012. 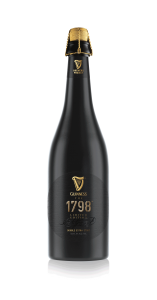 Guinness 1798 is available now at Dan Murphy’s in store and online. The recommended retail price is AUD$49.90.